I was going through the photos on my iPhone earlier today and I realized I never showed the final Wild Kratts costumes. 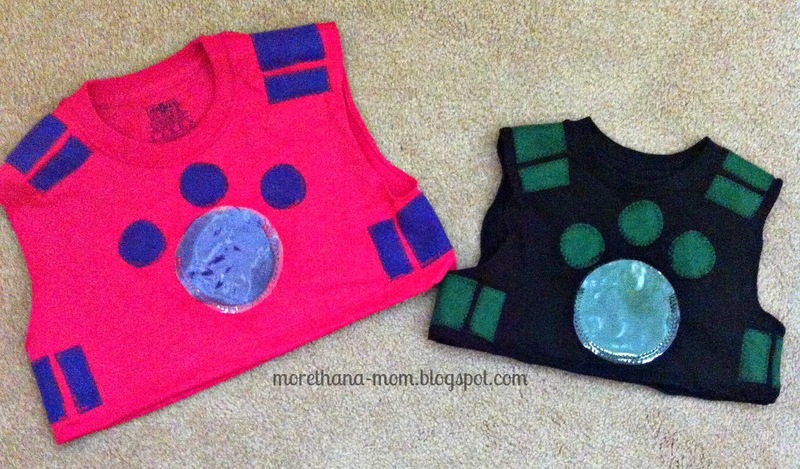 In September 2014 I did a "How to Make a Wild Kratts Costume" tutorial. I ended up buying cotton tee shirts and cropping them. I hemmed the bottom of the shirt and then got felt and zig-zag stitched the rectangles and circles. Finally, I got some clear plastic from a bag that came with a sheet set and I zig-zag stitched it on the sides and bottom. This lets the kids insert their "creature power discs" no problem. Let me know if you try this and what your kids think of it!